If you haven't noticed a new design has been uploaded and put into the site. It has taken me a long while to get it like this and it went through many design phases. This post is going to be all about what is new, and how it came to be like it is today. I can then get back to posting some series posts on design related topics. The design took a long while to do, I wanted a design that was well executed, looked good and was interesting to use and look at. I had in my mind a general feeling of what I wanted it to look like. It took 3 iterations to get it look like it is today. The first design ended up as red, it contained a lot of black and was very dark in appearance. Overall it was a very dark and "sad" piece. Nearing the end of completion I decided that I didn't like it at all. It didn't have the right feel to it. You can click on the image for the full version. The next one used more lighter colours. This was more along the lines that I wanted. Some of the background Graphics, including the circles, were from Go Media set I bought. Like the previous design it didn't feel right. The graphics didn't seem sharp and just didn't have the "thing" I wanted it to have. As you can see in the image below I didn't get very far into the design. The final design was then created over a couple of small design sketches of how I wanted it to look. I finally went for the paper options, since a lot of design is on paper. I use paper a lot. As well as this, as I was building it up it just seemed to work. Whats In The New Design? 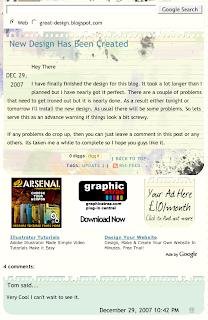 I spent a lot of time fiddling about with blogger and the CSS to get the design correct. There are a couple of stupid errors that seem to pop up in Internet Explorer, I have tried to fix them as much as possible but they still seem to persist. Anyway. I will work down the page and try to explain each concept. The main blog has had a couple of upgrades and features added. For example there is a search box at the top of the page. This is provided by Google, you can search both the website and the web from the same box. Moving down the small date images have been removed and replaced by just text. Each of the image you saw I had to upload individually. The text is easier to manage and of course means you can search by a date if you want a specific blog post. Finally at the bottom you have a small footer which contains small links. The back to the top link will send you all the way back to the top. Especially useful if you are all the way down at the bottom of a long post. As mentioned previously a better advert spot has been added. 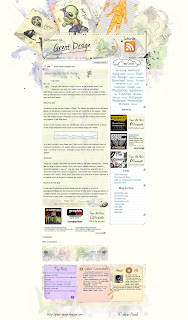 The sidebar of the blog contains one or two minor upgrades. At the very top is a Tag Cloud, a lot of websites have tag clouds. The tags are generated from every time I label a post. It is kind of cool I like it. 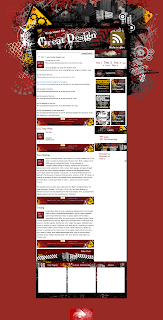 Below it are the usual Adverts, General Links, and the Blog Archive. The final part of the new layout is the footer. There wasn't one of these before, It took me a long while to get this looking perfect. The left hand box shows top posts for the previous week. This is updated weekly by me. The latest comments is a small widget feed that will show you all of the latest comments. Finally there is an about me element. This I think is quite important since you get to know a little bit about me. It is also used to fill up the last remaining box. To conclude, I hope you like the design. I'll once again resume posting, since Christmas and New Year are over. Over and out. Wow. I am so impressed. I have never seen your site, never been to your blog, nothing. I literally found this about 2 minutes ago via your tutorial at good-tutorials. You have an amazing design. 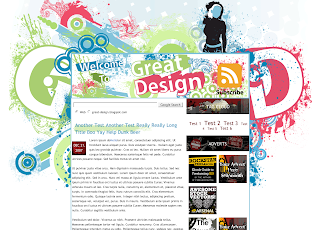 If you don't mind, I am going to feature your design on my own blog, elitebydesign.com. Keep up the very, very impressive work.